Pete and Maura Kennedy, taking a break from their world tour with folk icon Nanci Griffith, will perform at Mansfield’s Rose Garden Coffeehouse at 8 p.m. Saturday, Jan. 19. 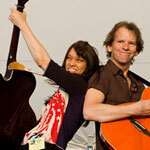 The duo is a Rose Garden favorite, having played there numerous times over the past 15 years. In a career that now spans two decades, New York duo Maura and Pete Kennedy have traversed a broad musical landscape, surveying power pop, acoustic songwriting, organic rock rooted in their early days in Austin, and a Byrds-inspired jangle that drew the attention of McGuinn, Steve Earle, and most notably Nanci Griffith. 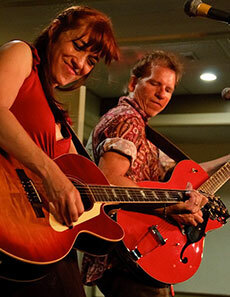 The duo co-produced Nanci’s latest CD, and are currently touring the US and the British Isles with the Texas songstress. Pete’s guitar work is evident throughout Griffith’s Grammy Award winning album “Other Voices, Other Rooms,” released in 1994. 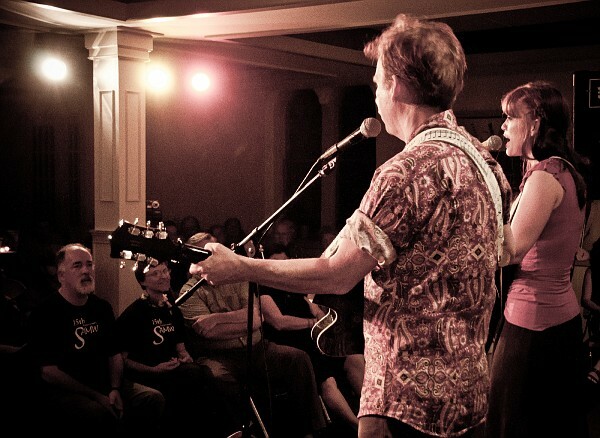 Pete and Maura Kennedy perform at the Rose Garden Coffeehouse in 2010. On The Kennedys’ new album, “Closer Than You Know”, just released on August 21, 2012 in the United States, and October 15, 2012 in the UK, The Kennedys strike out into new territory, this time inspired by a sojourn in Paris, where they immersed themselves in the turn of another century, the time when Debussy and Ravel were inventing the sonic palette of modern music. No strangers to reinvention, Pete and Maura came up with a cappuccino-fueled concept at a small café in Montmartre: music inspired by the Impressionist composers, married to the rock and pop sounds for which the duo have long been known. In the spirit of Paris-trained composer Burt Bacharach and his lyricist partner Hal David, Pete took on the task of creating musical landscapes that would cushion Maura’s lyrics and bell-like harmonies. The songs have a quality, inherent in Maura’s voice, that is both soothing and urgent. They met in Austin, Texas in 1992, when Pete Kennedy was playing in Nanci Griffith’s band, and for their first date, each drove 500 miles to meet at Buddy Holly’s grave in Lubbock, Texas. Soon, Maura Boudreau joined Griffith’s band as a harmony singer, and she and Pete began their career as a duo when they opened for her during her tour in Ireland. Pete is from the Northern Virginia suburbs of Washington, D.C. Maura grew up in Syracuse, New York. After many years living in the East Village in New York City in 2006, they joined the many other folk musicians living in Northampton, Massachusetts. They then returned to the East Village in 2008. The Rose Garden’s doors open at 7:30 p.m. For tickets and more information, visit the Rose Garden website. The Rose Garden Coffeehouse is in its 24th year of consecutive operation and has providing the best in live, folk and acoustic music during that time. The all-volunteer staff serves hot and cold drinks of the season along with a tempting array of home-baked dessert items in a setting reminiscent of a 60’s coffeehouse in Greenwich Village or Cambridge. News about upcoming performances, along with video links and other Rose Garden news, are all available at www.rosegardenfolk.com.